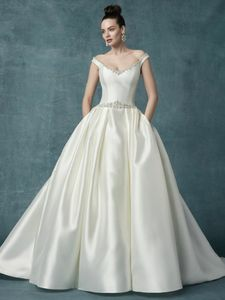 Description: This Yaron Mikado wedding dress features a dropped-waist bodice trimmed in beading and Swarovski crystals atop a billowing ballgown skirt. Complete with off-the-shoulder portrait neckline, V-back, and pockets at the hip. Finished with crystal buttons over zipper closure, drifting from back to hemline.